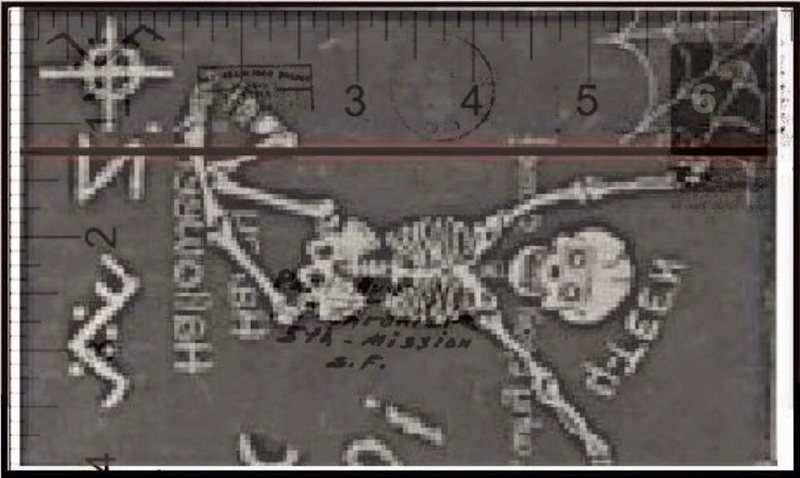 This takes you through the process of figuring out the scale of the Halloween card. Later on it will be rewritten. I have an Idea that the eyes on Halloween card could be an overlay key. Before I can try any experiments I have to determine the scale of the Halloween card. 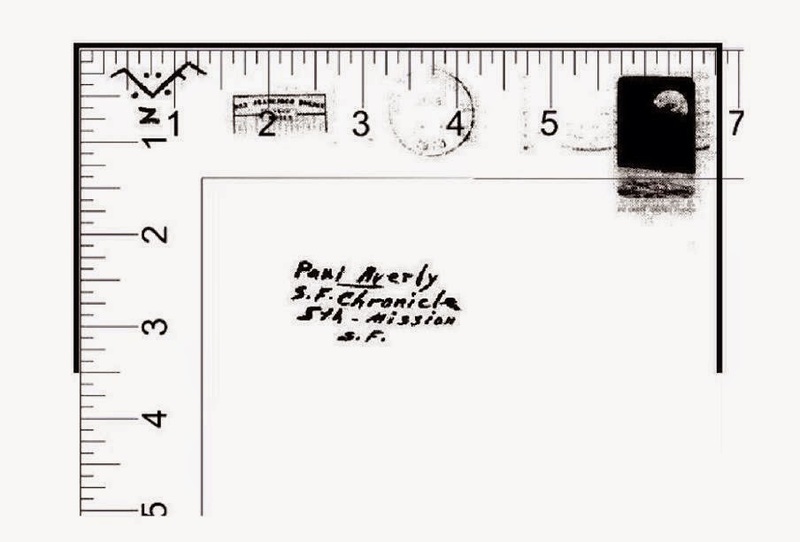 I don't know of any known examples that show proof of scale on the card (like a police photo), but it should be relatively easy to determine it. So I am going to attempt to do so and post it. Someone else may also find it useful. Unfolded the Halloween card should be the same size as a sheet of paper or somewhere close to it. I have a pretty good idea though. That is just speculation right now but I am working on it. I think I will also post some examples of the dragon card with proof of scale here just for the hell of it .....because you never know. I am going to post some examples here for now and work on it more later. I would kind of like to try my other experiments. Here is the dragon card with scale. 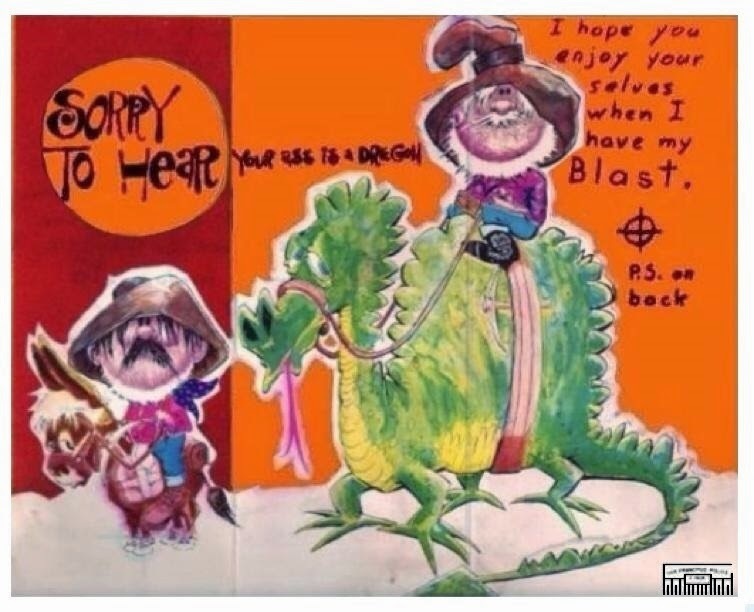 I cleaned up the dragon card by brightening the back ground then using the writing from the black and white scan I then overlayed the writing over the writing on the color card. Then I put a San Francisco police scale in the frame and colored the lines on it. That is all I did. I just wanted a clear color example of the card. It is still original. 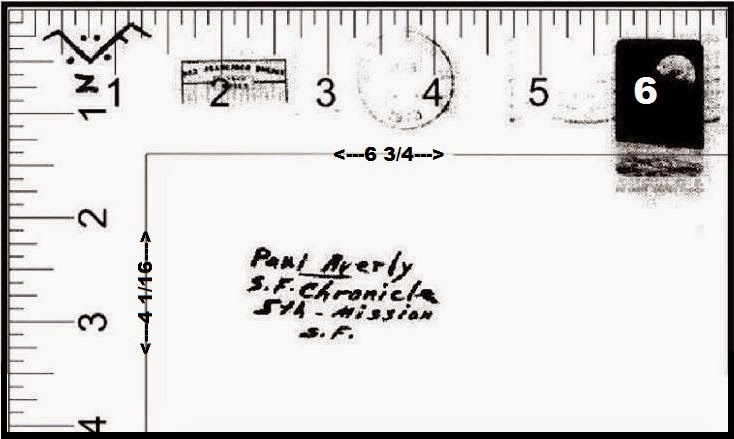 Here is the Pen Card with scale just for the hell of it . I just took the example below and matched it to the example above. I then erased everything except the scale mark. 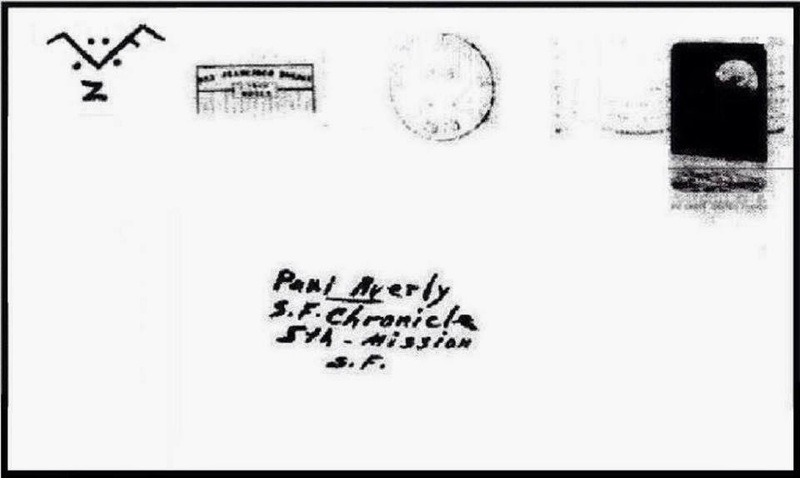 I had hunch that these two documents might be overlay masks to find hidden messages. That is just an idea but it is something I am going to play with in the future. I won't try to pass some bs off on you. If Ifind something interesting or good out of this then I will post it . 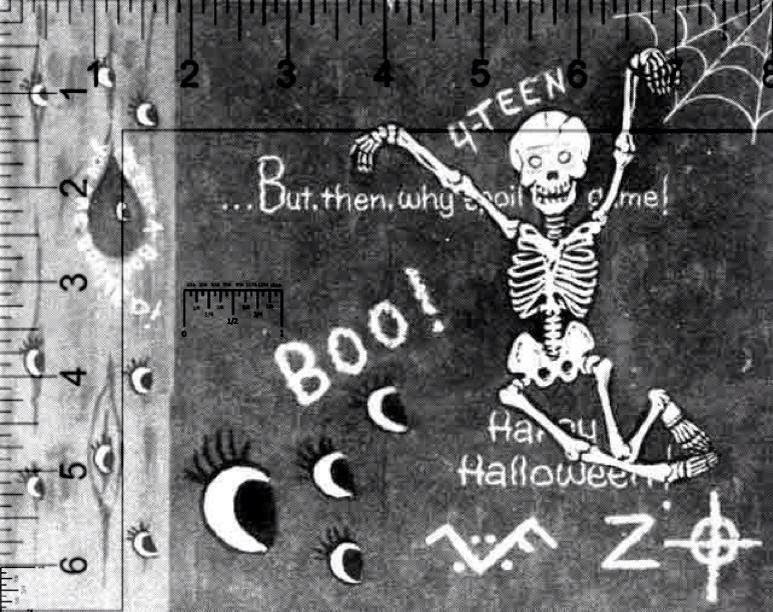 First we have to figure out the scale of the Halloween card. 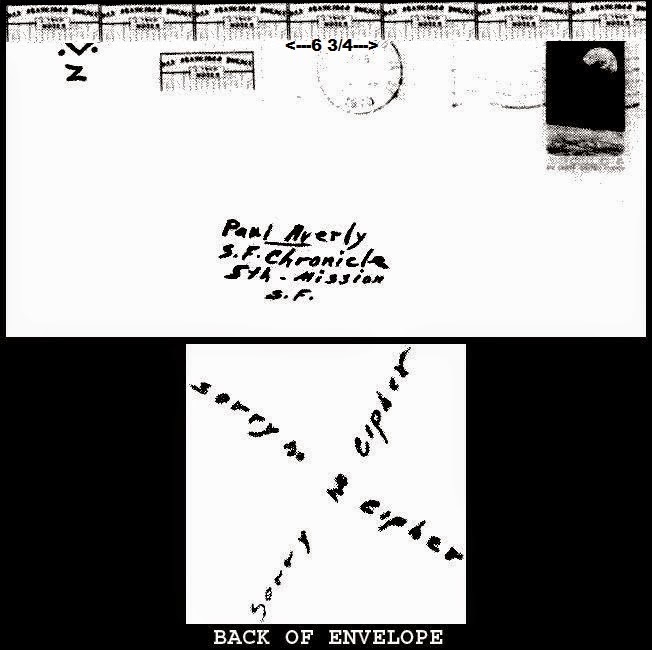 First you will see my experiments and some info on the envelope size. Then a few examples of an envelope I am working that shows detail.I have to work on that more. Then you will see my experiments on the card scale itself. I want some opinions from others on this before I polish it up. 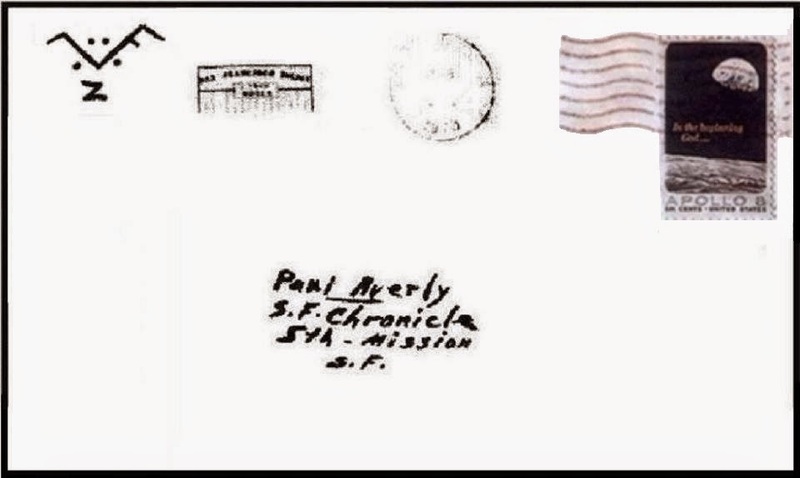 Here is the envelope with scale. I think I can use this to help verify size. Here is the replica I put scale in for an experiment..you will see more on this in a moment.. oddly enough.. I got it dead on. I didn't have the info I had about scale which you will also see in a moment. Below is a picture I borrowed from discjunkie. It is a site that sells movie memorabilia. I am going to do a few of these from a few different resources , and check them a few times against others to be sure. Hmm..this could get tricky. I am still going to see if I can find any literature about this stuff. I am pretty confident I can deduce the size of the card. First I found this example as a reference to the sizes of average cards. I am going to leave this here just in case for future use. Justin case. Here is another link from zodiackillersite (ran by Morf) that I think is relevant to this. 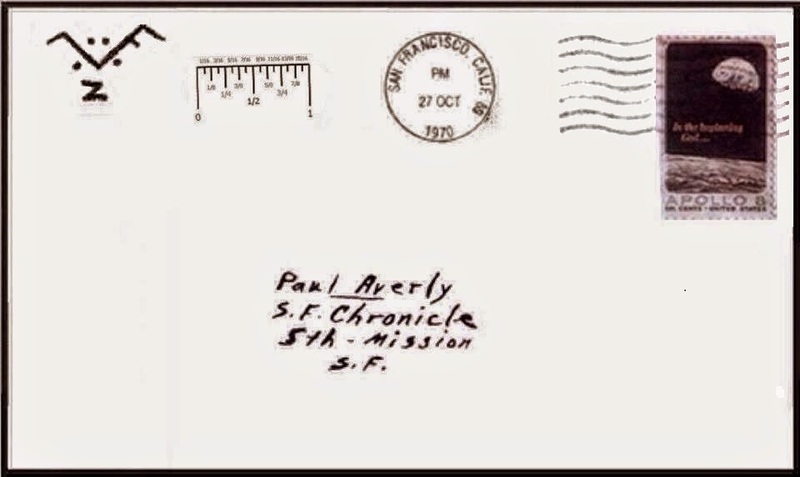 The author ..a man by the screen name , Tahoe27 states that the card was a standard card of the time. I have actually heard nothing but good things about these guys. He is right about the addresses not matching up.. I will show you an example of the two overlayed on each other later. Something I want to point out.. he said you could not determine the scale of the card from the replica.. 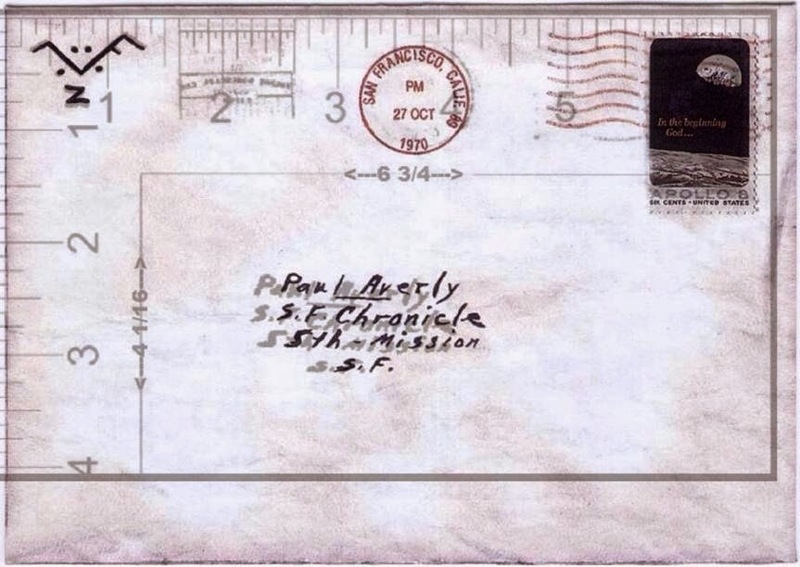 I just want to point out that I overlayed the original envelope over the replica and matched the v symbol with the post mark and the stamp then erased everything but the proof of scale and pretty well determined the correct size of the envelope of the replica with 1/16 of a difference in width than he found. I am just saying..lol. Either way it is close enough. I will compare the replica card against the original one day..Still his work was a great help to me.. 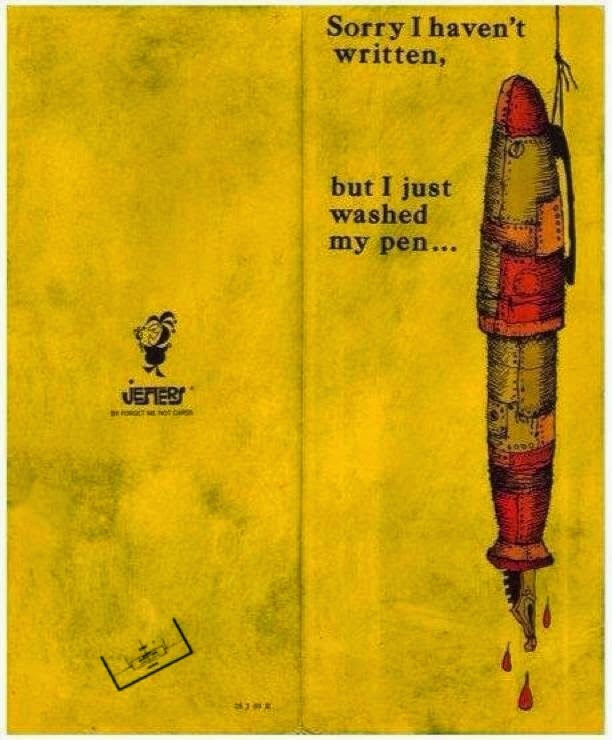 Without it I surely would have made mistakes. Kudos to Charlie. I will get this figured out now. Let me study this and see what guy did. 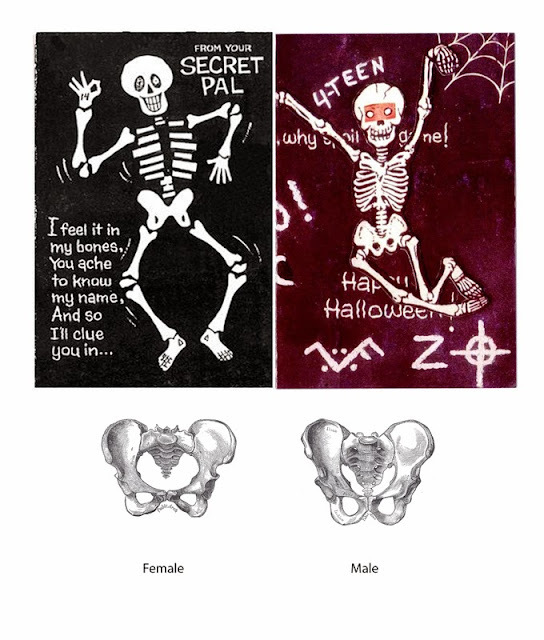 I am close to having a Halloween card with proof of scale. Lets see if I can make an example to those exact dimensions and see if it works. I just had a good idea on how I can clear a lot of this up over the next week. I can do fade overlay animations of the two envelopes. Also I can put actual rulers in these photos to measure this stuff. Iam going to study what this guy did first. IT might save me some work. If he is right then I can make a scale mark on the Halloween card. I am going to post these here so always have them when I need them.I may try a few different things. I am pretty sure this guy has it pretty dead on, but I have to test it all for myself. I may post this stuff as I do it then when I am finished I will go back and take all the crap off and clean up the post. keep in mind.. this is a work in progress. I think this one is a winner.. Here is an overlay of the original and the replica from the movie. As you can see the addresses on the two envelopes do not line up as , Charlie ,stated in his article that I linked you to. Here is an animation to show you the exact difference between the two. Here is a still shot of the Zodiac Killer Halloween card overlayed onto the replica made from the movie. I am going to attempt this but I am not promising I will be succesful. I think I can do it. I thought it might be be fun to post the whole process. 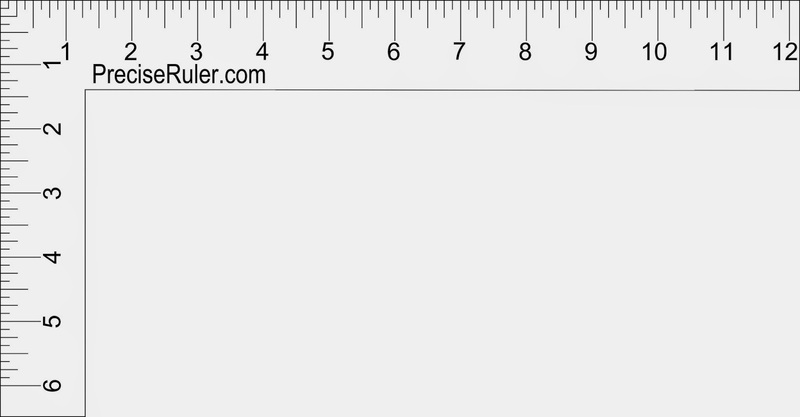 First I just erased the lines from the scale example with all the rulers and cleaned it up a bit. 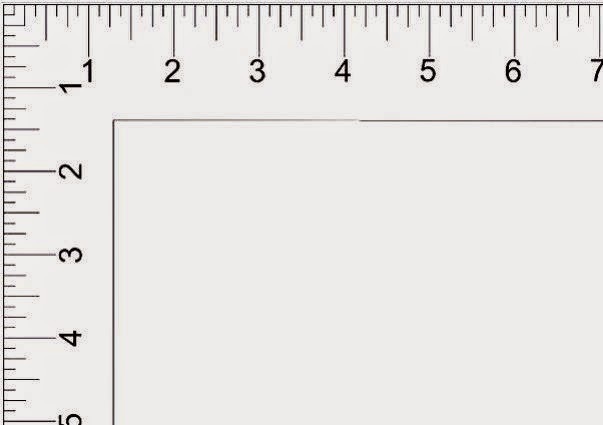 This example is to scale and everything else is just like the original found on the internet so if anyone has any problems with what I am about to do you can refer to this example. Now I will try to clean up all the features on the card. This should be interesting. First the stamp. I may work on the stamp some more later. Now I will try to clean up the post mark. The example above actually looks pretty good but I am going to keep going and see what I can do.. later I will choose one to keep. when I am finished I will do a fade between the original and my cleaned up example just to see if they match perfect. Now I am going to try the police scale and the V symbol. I am going to leave my scale on this one so people will know it has been worked on. I have some more of these at the bottom of this page. Here is a final product. Now I will do a fade animations between this one and the original found on the internet. Here is the fade.. I am pretty happy with it but I need to work on two little things, but that is for another day.. I can do better.. something I will work on when I am bored. I can make exact except for the 1970 on the post mark , but I have an idea for that also. I will redo this animation later. I will work on cleaning up the envelope more in the future. Everything I need is posted right on this page so I can't lose it . Now lets work on the card itself. I borrowed this from Charlie and he borrowed it from Graysmith. Assuming this is right I can figure it out pretty easy. Thank you Graysmith and Charlie. The example below is all I need to figure out the scale of the card. If you keep the aspect ratio then you can not get it wrong. Let me draw a few guidelines for good measure and comparison. Ok.. Now I will do some overlays of the card and envelope with scale and hopefully I can make a Halloween card with proof of scale. Now I just have to do a full size example that matches the point on the example above and we can determine the scale. Remember as long as you keep the aspect ratio then you can not mess it up. I have another idea. I will take part of the example above and overlay it onto a full size scale of the envelope then match the full size card to that. Here it is.. I can tell you the length of the card is 6 1/2 inches. Now I just match the full size card to the points on the example above and that will give us the width of the card. Here is a final example. Sorry about the detail but I have to work with what I have.Let me do some more research and maybe get some opinions and then I might try to make some quality examples of the full card with scale. I think I know everything I need to know..I think.. This is the card we will be using. It is the one in the book in the example above. Here is a fade to show you the difference between these two cards. They are not the same scale. Size wouldn't matter if they were the same scale. You can see they off just a little and the eyes do not line up. I am going to try some experiments later to see if i cam match them up better but for now I am going to use this black and white example to work with . They are still pretty close. I have to do a little more research on this and I might be able to make it work. Here is the fade. First the top of the color card has been cropped off and it is also a little wider than the original. They could have just made it exact. lol. Now I am going to put a ruler in the Halloween card and match it to 6 1/2 x 8 inches. Here are few with the one inch scale in different spots. 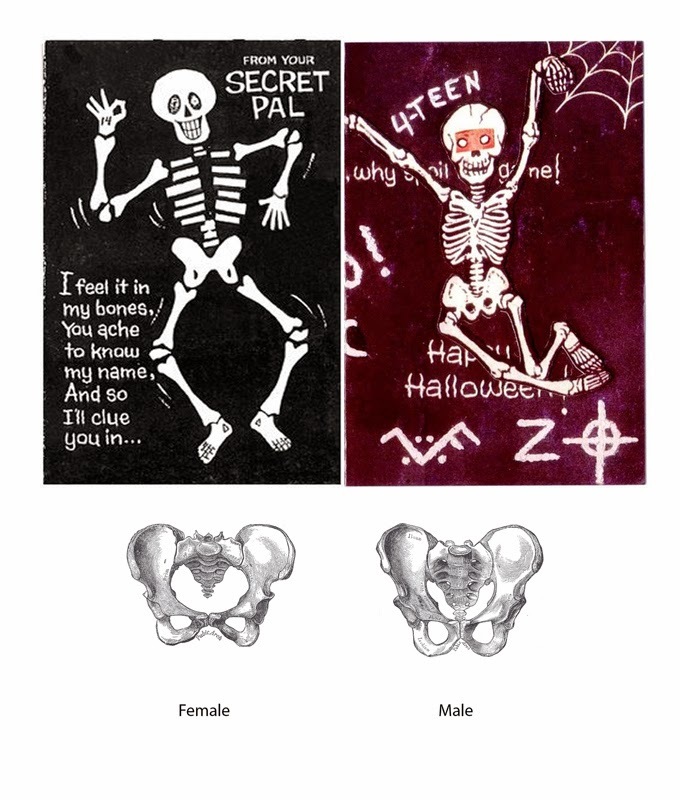 There is a Halloween card with scale. Later I will do the other side then maybe do some detail work in my spare time. I think If i cut the colored replica up and put it in piece by piece over the black and white scan that I may be able to fix it.. I don't know..we will see. It is not something I can do over night so if I do try I post my my work and keep updating the same pic over time until I get it right , but the Zodiac killer Halloween card scale is dead on 6 1/2 x 8 inches. 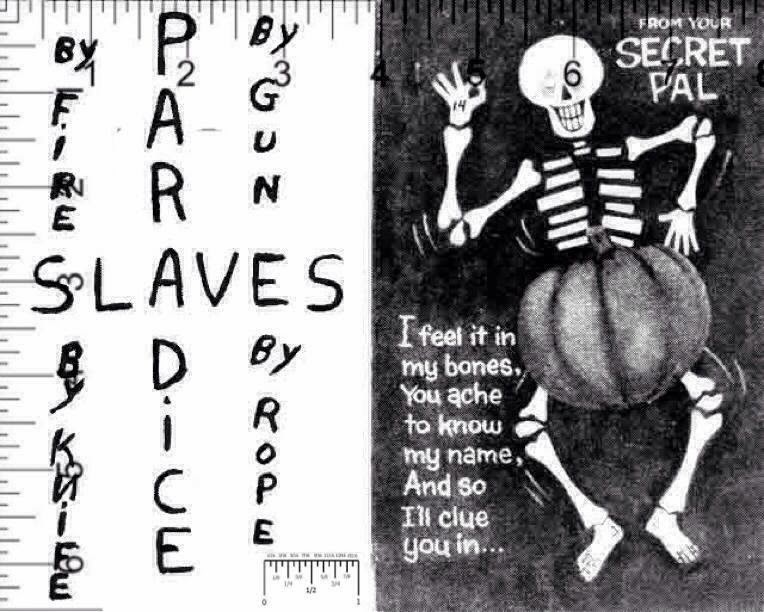 Here is the outside/front of the Zodiac Killer Halloween card with scale. I want to see the difference between the front of the real card and the reproduction card. I made two fade animations. On this one I aligned the writing on the back of the card. On this example I aligned the words on the front of the card that read ," I can feel it in my bones you ache to know my name , And so I'll clue you in". I am going to post this here.. I have an idea that the eyes could be an overlay mask for finding hidden messages. Another thing that cries out "overlay mask" is the mask on the skeleton sticker. Things lie this are literally called "Masking". If that is what it is , then who knows where it works or what we might find? 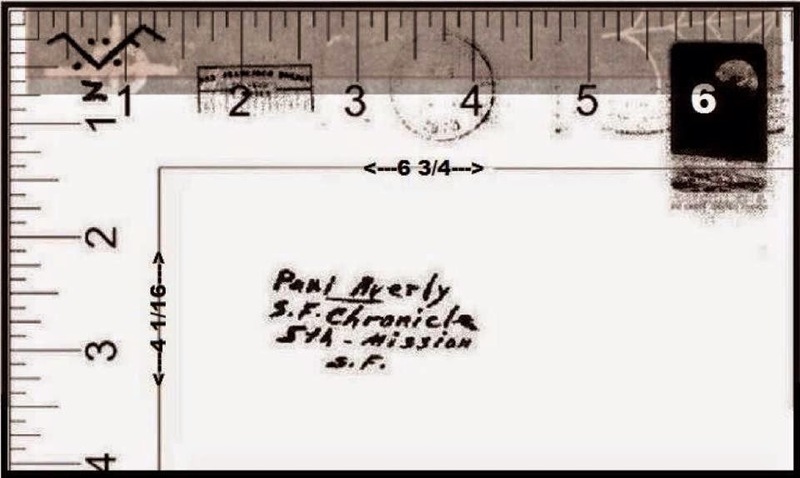 It could be used on the letters or the codes. I made the example below just to see how it might look and get an idea of the size compared to the letters. It looks promising, but who knows. I guess over time we will find out. Someone else may find this stuff useful or see something in it that I didn't see. Here is the section of the card that I am interested in right now. I snipped both of those from each card and I snipped the whole section of each. Let me show you how different they actually are. Let's see if the eyes match up. I this example I mined up 3 of the eyes on each card and kept the aspect ratio.. I think I might be able to manipulate is and make it work... Why? I don't know..lol.. I can use the black and white card for my experiments but still I guess this needs to me known and may save some else some kind of trouble later down the line . Just for fun though I am going to see if I can line them up. I think the example below lines them up. Here is a fade of the two.. I shocks me how different they are. This actually confused me because the color reproduction was bigger that the original when it was created. In the end I had to shrink it and change the aspect ratio just to make they eyes match..and it's crooked..Wow. That is good to know though. I might avoid future mistakes with this info. I don't have a clue how they did that. Yes I do.. For the reproduction card they cropped off part the the original card. In the example above you can just how much they cropped from each end.. Then they blew up the remaining section then printed it as the reproduction. If this does turn out to be an overlay mask something like that could have messed everything up. I think I will put a scale mark in this photo and post it at the bottom of the page. I may try to compare the whole card in the future. If this stuff helps anyone out then you are welcome to use it. Here is some to scale models of the envelope. Later I might do one high rez model just for the fun of it ,but for now I want to work on the card some more. Here are some I worked on. They will be the blueprint for the high rez model I will make in the future, but these are still pretty good. Actually I think it I stretched those wavy lines just a bit they would be an exact match. 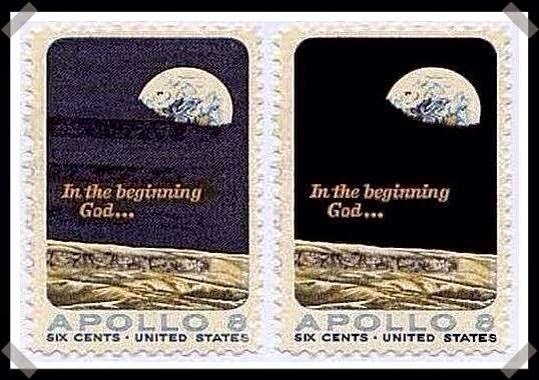 I do want to work on that stamp just a little bit more. Maybe in the future. Here is the inside of the Halloween card with scale. 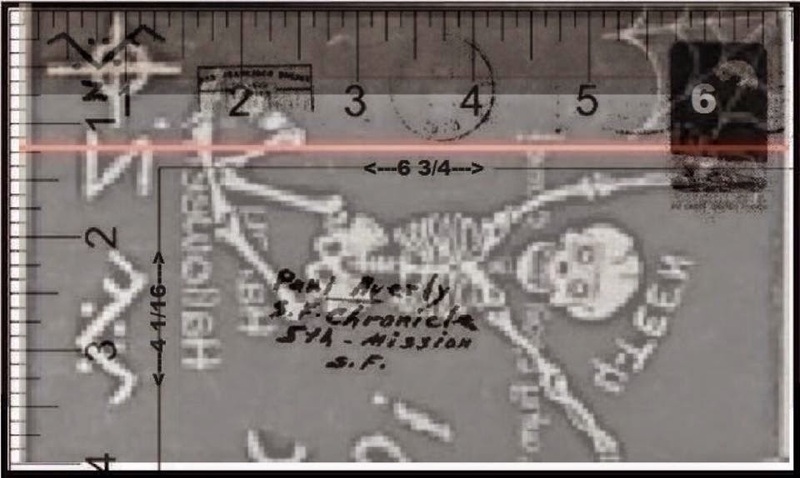 Here is the section with the eyes with proof of scale. I don't think I can do a color example, but It is something I will think about and look into. I wouldn't mind having a color scale example. It would be a lot of work, but it is winter and I need things to keep me occupied. Also later I am going to do some research on how much of the card was altered and add it to this post. Something about the Halloween Card I want to point out. I don't know where to post it so I will post it here. I think I will do some research and find out all I can about this card and post everything in one post. That is a good point and attention to detail. I found it here.